The history of Kylemore is the history of two homes - Kylemore Castle and Kylemore Abbey - and of two communities; the community within and the community without. The period covered is from 1862 to 2002, from the time Mitchell Henry first took possession of Kylemore right to the present day. Kylemore Castle was built by Mitchell Henry for his family and friends, but carrying with it a community of 125 tenants. The two communities were from the start interlocked, their fate intertwined. Out of two changes in ownership came a very particular community; the community of Benedictine Nuns. The transformation from private home to Abbey took many years to achieve and tremendous dedication and determination on the part of the Benedictine Nuns. Under the Nuns the tenants won their land and were given the opportunity for further education and employment. 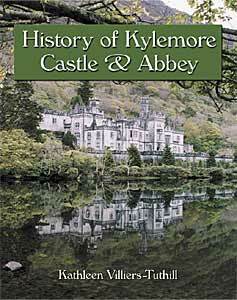 The story of Kylemore - both Castle and Abbey - is a truly remarkable story. The twists of fate which have marked its history at crucial moments from its inception, the crises and moments of sadness which its occupants have endured, and the inspiring examples of courage and resilience which have marked their response to various challenges, combine to constitute a rich historical mosaic. The genius of the place itself - with its wild beauty and its remoteness - is crucial to any understanding of the human stories of Kylemore. The habitat has provided a sense of peace, and a site of prayer and contemplation, for the founding family, for the Benedictine Nuns, their pupils and their friends, and for countless visitors during the past one hundred and forty years.